Disclaimer: *Lease: 4.90% for 48 months. Offer expires April 30, 2019. 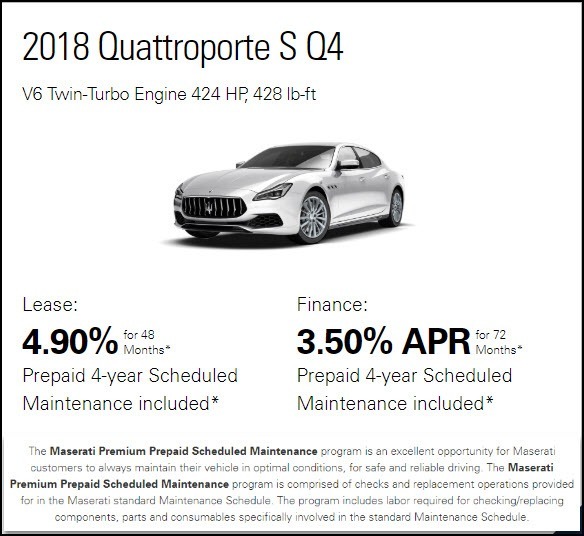 Limited time lease offer provided through SCI Lease Corp on approved credit at participating Maserati dealers and is valid on 2018 Quattroporte S Q4 models only. *Finance: 3.50% APR for 72 months: ON APPROVED CREDIT. Offer expires April 30, 2019. Limited-time offer provided on approved credit by RBC at participating Maserati dealers on 2018 Quattroporte S Q4 only delivered by April 30, 2019.